A rainy, windy and, more than a little, chilly Thursday was the backdrop for this curiously mixed tasting. The day after was a holiday, however, and the location only a few hundred metres from home so a little discomfort wasn’t much of a sacrifice. My friends Kristine and Andy found out about the Chocolate and Ale session from the Bristol Beer Factory stand at the Love Food Festival the previous weekend. The presenter this evening, Andrew, must have sold it well because there we all were listening to him and Lisa from the Chocolate Tart introduce a session that focused on quality, taste and adventure. Ale: Sunrise was the first ale and was golden with citrus and red fruit notes. The hops seem to be extra special at the moment we were told and the taste was light but slightly bitter. Chocolate: A disk of Manjari 64 per cent cocoa was our first chocolate taste of the evening. The best chocolate does not have to be 70 per cent apparently and this was a dry tasting chocolate that didn’t release its flavours until it was chewed and tasted for a while. Andy pioneered the snapping sound test and we proceeded to do it to all the chocolates that followed. I’m pretty sure they all sounded the same but that could have been the ever-increasing influence of the ale. 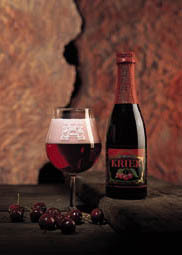 Ale: Lindemans Kriek, a bright cherry coloured, and flavoured, beer from Belgium. This is a lambic beer which is produced by spontaneous fermentation through exposure to wild yeasts and bacteria. The process begins with a sour beer and on refermentation there is an addition of morello cherries. Much flavour and sweetness to begin with and ends on a dry and slightly sour tone. Chocolate: a Chuao chocolate made by Amadei which is very special indeed. The chocolate takes its name from the Venezuelan peninsula where the seeds are produced. This is a dark chocolate without the bitterness found in products of low grade cocoa with the latter being more available because they are easier to grow. Ale: Exhibition beer (5.2%) which has been brewed in Bristol for over 20 years. Originally from the Smiles brewery, the beer later had its name changed to Heritage because of threatened legal action. One of the brewers went to work at Bristol Beer Factory and brought along the recipe and the beer was given back its original name. Easy on the nose but stronger in flavour and much more bitter than the other drinks that evening. Chocolate: A top quality chocolate used by chefs, Ganaja by Valrhona. More flavours than the Manjari disks provided with our first beer. Delicious. Ale: The IPA 6.8% had its debut in this tasting session and it was my favourite beer of the evening. The use of American hops is said to be the source of its fruity taste and it was an enjoyable and full flavoured beer which was fragrant and tasted quite light for its percentage levels. Much plaudit was given to American experimentation with beers and a suggestion that English beers try to aspire to some of these levels were greeted with pleased support from our table. Not least from my American friend Kristine. Chocolate: This was a chilli infused sweet with quite a kick to it. The ouch factor was very evident and at the same time the taste was lovely and not overpowered by the heat. The idea behind the chilli chocolate was that this was the type of beer that would be most suitable for a curry. 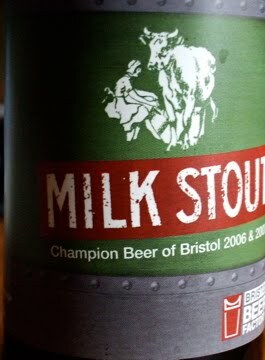 Ale: The Milk Stout was a favourite of the night and was awarded Gold Stout status in CAMRA’s cask and ale class, 2009. The last cask is now available at the Grain Barge and won’t be around for another four to five months after that. The name comes from the use of lactose sugar which does not break down in the fermentation process and allows for the sweetness to remain in the drink. Chocolate: Jivara, delicious, dark, strong and sweet. There was also a specially prepared selection of Milk Stout Truffles created for the evening and they were superb. Small hand-made creations which varied in sweetness when drunk with the ale and without. Kristine and I both bought some at the end of the evening. Ale: The Black 77 which takes its name from its colour and its percentage: 7.7. A dark and intense drink which nevertheless was quite easy to drink but maybe not as much as the previous ones for me. The guys really liked it although I think the Milk Stout was their preferred drink of the evening. Chocolate: Skylon which was dark and intense, much like the drink. By the time the last drink was poured and drunk we had decided that attending had been lots of fun. The location was perfect (especially for me and my housemate, although a little further away for the others), the information useful and fascinating and of course the beer and chocolates were just lovely. The latter will have to be enjoyed on Easter Sunday by Kristine who had given up chocolate for Lent but carefully stored the little tastings away for an extra treat in a couple of days. Her heroic effort at resisting the incredible chocolate was most impressive. I don’t think I could have done the same. This entry was posted in Bristol, Food and tagged ale, Bristol, Bristol Beer Factory, Chocolate, Chuao, Exhibition beer, Ganaja, golden ale, Grain Barge, IPA, Kriek, Manjari, Milk Stout, review, Sunrise ale, The Chocolate Tart. Bookmark the permalink.